Indiana Pacers water resistant watch. 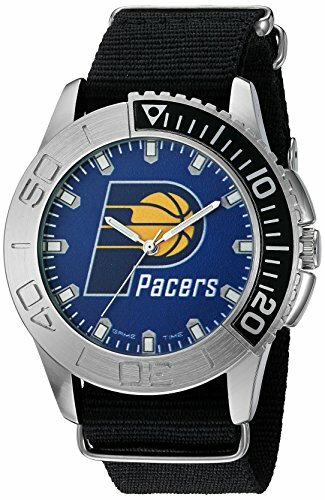 This Pacers men's sports watch features a stainless steel case back with a Nylon strap with sunray dial, Japan quartz movement, and is water resistant up to 3ATM (99 ft.). Fits wrist size 7.25-8.25 inches. Durable mineral crystal protects watch from scratches, water resistance of 99 Feet/30 Meters/3 ATM, and all with a Limited Lifetime Warranty! If you have any questions about this product by Game Time, contact us by completing and submitting the form below. If you are looking for a specif part number, please include it with your message. Game Time Unisex MLB-ROB-NY3 "Rookie Black" Watch - New York Yankees - "Pinstripe Logo"